In his 68 TV Special Elvis Presley says something like, ‘I’d like to do my favourite Christmas song, of all the ones I’ve recorded.’ He plays and sings ‘Blue Christmas.’ The scene deceives the viewer. The song ‘Blue Christmas’ was not actually played in the sit down session where he revealed his favourite Christmas song. Presley preferred the much bluesier ‘Santa Claus Is Back In Town.’ The TV version of ‘Blue Christmas’ remains essential because half way through Elvis urges his musicians to ‘play it dirty’. In an instant, Elvis reveals his notion of what constituted grit and fire and we understand immediately how he differed from his critics. He saw potential for rebellion and protest in the unlikeliest places. I really only mention it because Big Al Downing plays it dirty, too, and like Elvis his music came from or finished in odd places. In his biography ‘Elvis’, the muck raker Albert Goldman attempts to dismiss Elvis as no more than a mimic. Goldman is half right; Elvis did have a talent for mimicry. His imitation of an upper class Englishman on an alternative take of ‘Is It So Strange’ is both hilarious and eerily accurate. Goldman conveniently forgot, though, that his ability to bend his voice enabled Elvis to create styles that were unique to him. Big Al is not as original as Elvis but he is a talented mimic and it meant that he would never be restricted to a solitary genre. Big Al was noticed by the English on a compilation based on the UK record label, Sue. The label combined 60s soul music with tougher rhythm and blues. The music on Sue ranged from Major Lance to Howling Wolf. Big Al was probably included because he was black and because ‘Yes I’m Loving You’ is such a great record. Nobody complained that a compilation of rhythm and blues and soul included an archetypal rockabilly hit because nobody really noticed. There is a website that honours Charlie Gillet. He was a DJ on Radio London and author of ‘The Sound Of The City’ which provides a very good history of rock and roll and rhythm and blues. Gillett is now dead and the website evokes a poorly maintained grave. Some of the comments are quite old. The hit ‘Yes I’m Loving You’ is mentioned. One person says that the record is just Fats Domino. Another disagrees and urges us to listen to the rockabilly guitar solo. The guitar afficianado understands correctly that ‘Yes I’m Loving You’ owes more to Memphis than New Orleans. 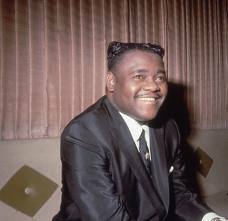 But if UK soul and rhythm and blues fans listened to their Sue compilation and missed the dose of rockabilly planted in the middle it is understandable that someone today can hear the record and only hear Fats. The Fat Man was an influence on Big Al who could and does recreate him when required. His versions of ‘When My Blue Moon Turns to Gold Again’ and ‘It Must Be Love’ sound as if they were recorded by Fats himself. Big Al is not as versatile as Elvis but he he could create more sounds than most and he could impersonate virtually anyone. Later in his career, this would become a feature of Big Al’s stage show. He would do impressions of Elvis, Jerry Lee, Little Richard and the rest. On stage the impressions were choreographed. On record he was less disciplined and Big Al somewhat endearingly often forgot who he was impersonating. 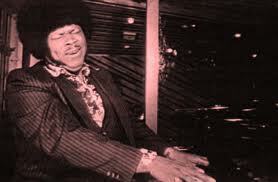 The best example is ‘Oh Babe’ that mixes Larry Williams, Little Richard and Fats Domino in one record. Neither was he slavish about matching voices to the arrangements we associate with those voices. His Little Richard impersonation could feature on a rockabilly track and his Fats could appear on a pumping Little Richard style rocker. The results are initially confusing but subsequently educational and always exhilarating. Still available is a four set compilation of rock and roll that is identified by the word ‘sugar’ in the title. These sets consist of three CDs. The set ‘Raunchy Sugar’ is devoted to Memphis rockabilly and there are two sets called ‘Heavy Sugar’ which concentrate on New Orleans rhythm and blues. 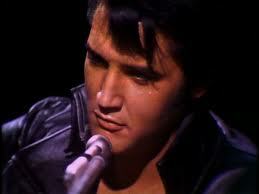 The Memphis set has a photograph of Elvis indolently accepting female adoration. The New Orleans collection has Fats looking into a pot of gumbo that is being prepared by his wife. Both men were more complicated than this attempt at thumbprints. Fats strayed from sexual fidelity and Elvis, as my grandmother used to say, liked his chuck. Listening to these sets back to back is illluminating. The arrangements are obviously different. The Memphis records have sparse instrumentation and feature bold and prominent guitar solos. The New Orleans records have driving horn riffs. They may have played it differently but in the fifties the musicians in the two cities heard and played something new. Obviously, rockabilly fed from rhythm and blues and black music. 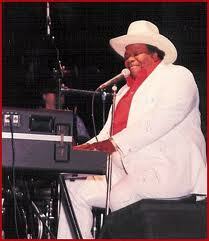 Fats Domino was making rock and roll records before the white boys in Memphis. But listen to the CDs back to back and it is clear that the music of each city influenced the other. Riffs appear in New Orleans records that surprise you and the same happens with some of the hits from Memphis. There were links. Rock and roll may be simple, and instinct is important so sometimes the musicians would not have realised that they were importing ideas. Awareness, though, is obliged to intrude. The curious and the opportunists are always present. This is why Elvis and Big Al Downing are important. Both men could reproduce easily what they heard around them and both were interested in ‘all kinds’. Much has been written about how Elvis found inspiration in black music. Less is said about the black musicians who were as curious about white music. The interest of Ray Charles in country music is well known but he was not alone. 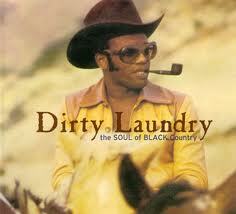 There are two fabulous CDs available called ‘Dirty Laundry’ and these collections document effectively how many black musicians were obliged to record country material simply because it was there, because it was different and sometimes because somebody said they should not. There were also many black musicians who because of temperament were drawn towards country music but failed because black musicians were not welcomed. Elvis was white and he had the freedom to cross genres. Times changed allowing the curious Big Al Downing to add country music to his reportoire as he became older. Eventually, he was inducted into the Rockabilly Hall Of Fame and secured a nomination as Best New Artist by the Academy Of Country Music. Elvis made rock and roll acceptable to a pop audience and later his music changed in ways nobody could have predicted. Goldman never persuaded his readers that Elvis was only a mimic but too many are prepared to dismiss Big Al as a follower. They should listen to his classics like ‘Down On The Farm’ and ‘Georgia Slop’. His great moments alone are important but before you seriously assess the man listen to the music of Memphis and New Orleans. Discover what kept the music distinct but also what pulled it together. The romantic myth is that rock and roll was sourced by originals. They played their part but the others should also be remembered. The missing links – the mimics, the opportunists and the curious – are not often given the credit they deserve. A great read Howard! You might enjoy my dad’s blog at bobbypoe.com – it has a lot about Big Al Downing, who was a member of my dad’s band Bobby Poe and The Poe Kats. I am really pleased to get a comment and a compliment. I am now going to listen to the tracks I have with Big Al Downing and Bobby Poe. I have tried to get on to your dad’s blog but I am getting service unavailable at the moment but I will keep trying. As soon as I find the blog I will subscribe. Thanks again. Thanks for highlighting this artist, he is one I hadn’t heard of so will look to forward to hearing some new sounds! As always, a very insightful piece. Thanks again.